The implants are usually anchored within your jaw bone under local anaesthesia. 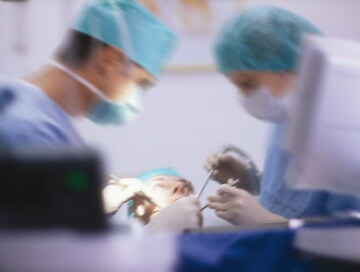 If required, the operation can also be carried out under general anaesthesia. In this painless operation little holes are drilled into the jaw bone into which the artificial roots or dental implants are then placed within just a few minutes. Depending on the patients' requests, the circumstances of the operation, and medical necessities, we use implants made of titanium or zirconium oxide. We are also happy to treat you using the latest advancements in digital technology (see computer-assisted implantology). After a healing period of several weeks up to a few months (depending on the bone quality, the position of the implants etc.) the definitive crowns, bridges, or dentures can be fixed over the implants. We are pleased to report that our patients have been extremely satisfied with the methods of immediate implantation and load for many years. In this procedure, implants are immediately inserted after the extraction of a tooth. In the case of immediate loading, the prostheses are fixed over the implants as part of the same operation. In case of bone defects or bone loss, lasting results can only be achieved if implants are placed after previous or along with simultaneous bone augmentation. For this operation we can offer you all currently available methods, using the patients' own bone material or substitutes. Our gentle treatment methods require very short periods of recuperation. Independent of the complexity of the operation, the number of implants, and a possible bone augmentation, our patients usually require no or a negligible amount of pain killers. The better the quality of the bone and the more substantive the bone tissue, the easier it is to anchor the implants. Even with patients suffering from osteoporosis or a weakened general condition, high-quality treatments with implants allow for a vast improvement in the quality of their lives. We are even able to achieve attractive looking gums from poor initial situations by employing special micro-surgical procedures. Although elderly patients are frequently suffering from an increased bone loss, implants can still be placed using very gentle procedures. There is no age limit for this operation. Modern treatments and implants still allow for a safe implantation of high quality. Even if the bone structure and the gums have largely receded, special microsurgical interventions help to provide an aesthetically pleasing reconstruction of the gingiva. Important: The implantation itself is always painless, even if it involves a number of implants or a necessary bone augmentation! Thanks to our gentle treatment methods our patients are often able to go back to work the following day. If required, the operation can be carried out under general anaesthesia. By working closely together with our technicians and assistants, we can guarantee a professional treatment in every respect.